Last Sunday, in an attempt to escape some personal doldrums, I set out to New Westminster to enjoy the walk outlined by John Atkin in his book, SkyTrain Explorer: Heritage Walks From Every Station. New West holds a strong place in B.C. history, having the distinction of being British Columbia's capital city, though it doesn't hold much in my imagination, spending most of my time in Vancouver or its suburb to the East, Burnaby. I've spent far more time in Surrey than in New West, and New West has always been closer! I followed the trail set out by Atkin except for a couple detours, both pointed out by him. I erroneously fully crossed the pedestrian bridge over the rail tracks, stopping past the point where Atkin recommended to see the back of the old CPR station, now The Keg restaurant. Heading back, onto Columbia, I wanted to see “the wonderfully illustrated neon and backlit plastic signs along Begbie and Front Streets denoting Ladies & Escorts, Mens and Licensed Premises”. Maybe I didn't look hard enough. My other detour was to take a look at Galbraith House on 8th (pictured), near the end of the walk. Though not in and of itself unwelcome, a phone call from my sister prevented me from finishing the walk in time to get back to my place in time for an appointment. I liked walking around downtown New West, and look forward to walking the previous chapter's route, around Columbia Station. I wonder if the city will be as quiet as it was on that sunny Sunday. This walk, more than others, drove home the sense that I am not a flâneur, someone who strolls the city in order to experience it and notice it, or at least resist the label. Things generally have to be pointed out to me, be it either my girlfriend ("hey, Richard, look at that!") or a celebrated Vancouver neighbourhood historian in a book. I neither seek out nor get a lot of resonance from exploring the city. I acknowledge that the act of noticing mundane things and documenting them fills me with a small joy every time I do it, but I'd hate for someone to make it more than it is. Lately I struggle with people attaching too much significant to regular things, in part because I feel left out from the significance-making but also in part because I don't care. I struggle with opinions held about the "city lecture set", people whom I call friends but wonder why they fuss over the history of a city which a large percentage of the residents don't even come from. I undertook walking around predefined routes of SkyTrain stations because, one one hand, I sit at my desk too much and feel I can't participate in conversations about the city, but on the other hand, I love SkyTrain. To a guy who had train wallpaper in his room and who grew up 2 blocks away from a still-active small town train station, it's the neatest thing in the world. I don't love SkyTrain walks as much as the mode of transportation that gets me doing them. I don't love walking around unknown city blocks as much ... as much as what? It drives home for me the unanswered question "what do I love doing?" The question, part of a longstanding thread where I compare myself to others and come up short, haunts me because I surround myself with people who have figured this question out and are either doing it or seeking it out. It haunts me because if everybody has a story, then what's mine? Glad you took the time to come out this way. New West is underappreciated. 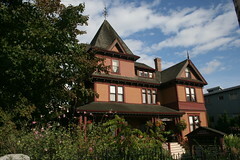 If you like architecture and/or history, New West has some great heritage house tours. If you walk east of 22nd St. Station, along 7th and around that neighbourhood (between 20th and 12th) there are some cute older houses, but the real gems are up in Queen's Park. Next time you're up for a SkyTrain + short bus ride, go to New West SkyTrain and catch a bus up the hill. Ask anyone how to get to Queen's Park and you'll get directions, or go to 6th & 6th and walk east. It's a stunning area, with some of the oldest houses in Greater Vancouver. The other walk you can try is to stroll the Quay. Get off at New West station and cross the pedestrian overpass next to the Keg. You'll end up at the Quay Market, and you can walk down the Fraser from there. If you like boats and history, go see the Samson V, which is an old paddlewheeler docked near the Quay Market. Thanks for the tips! And thanks for the mention on your blog! I hope to do the Columbia Station tour next, with a side trip to Surrey (I haven't really visited the areas around Scott Road or Gateway stations). That was the one disappointing thing about John Atkins' book, that his tours stopped at Columbia when Surrey is interesting too, dammit!